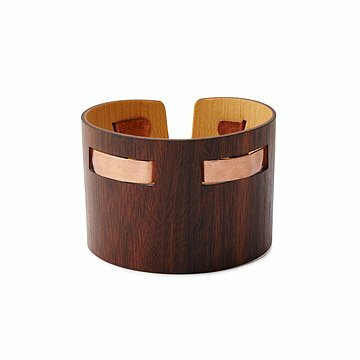 This handcrafted cuff bracelet features rosewood and copper. This handcrafted cuff by Henry Wischusen is a wearable celebration of materials, combining the warm appeal of natural wood with the inviting luster of copper. The band is crafted from thin layers of contrasting rosewood and maple, flexible enough for carefree wear. Woven through its perforations, like hand stitching on a garment, is a narrow band of pure copper that provides textural and tactile contrast. The bracelet flexes to slide onto your wrist, and naturally relaxes with the warmth of your body to provide a perfect fit. The wood is finished with three coats of tung oil and a protective coat of carnauba wax. Handmade in Peachtree Corners, Georgia. Wipe with damp cloth. Apply a light oil such as mineral oil or walnut oil occasionally to increase luster.